When you set up a WebSphere Portal cluster, the WCM_HOST and WCM_PORT environment variables need to be changed so they point to your webserver address. This is important for syndication. If you don’t make this change, syndication will go through the individual node instead of the load balancing webserver. This is a problem if the individual node goes down – syndication will also stop too! We don’t really give you a ‘scriptable’ way to do this, which would be good if you needed to do it many many times. The manual steps are described in the infocenter topic for Portal 7.0 here (step 10). Alternatively, if you don’t want to copy the script to each node, you can set the ServerName and NodeName variables on the command line too and just invoke the task as many times as you have cluster nodes. IBM Bootable Media Creator (BoMC) is a nifty tool that will create a customized boot iso for installing drivers and firmware on your System x machines. You tell BoMC what hardware you are running and it goes out and downloads all the latest firmware, and then it wraps it up in an iso that you can boot from to update the hardware. If you’d like to create your BoMC iso using Ubuntu , you might’ve noticed that BoMC doesn’t support it. I’m on 10.04 and found that using the RHEL5 binary worked. At the time of writing, the name of the file is ibm_utl_bomc_3.00_rhel5_i386.bin . I tried the RHEL6 one first and it complained about a missing libssl library (libssl.so.10) so I would guess if you are on a newer version of Ubuntu, you should use this one instead. Can't find OS info file! Simply execute this to create an Redhat release file at /etc/redhat-release , and this will make BoMC work. A simple fix for once. I usually see this problem when I’ve installed a barebones / headless system and then wanted to add xorg to it later. This particular time, this error cropped up when trying to run Eclipse Memory Analyzer over a X11 Forwarding session using SSH. Eclipse would throw this error and fail to start. JVMDUMP006I Processing dump event "abort", detail "" - please wait. JVMDUMP013I Processed dump event "abort", detail "". If you don’t have dbus-uuidgen , it’s in the dbus package, which can be installed by issuing yum install dbus (of course!). 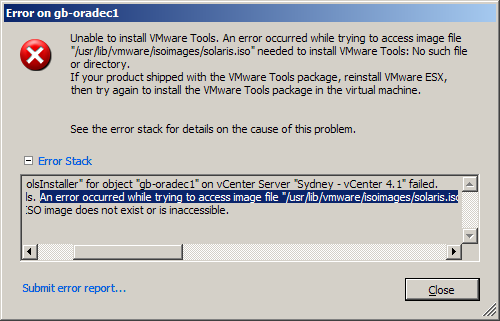 What sort of disk is VMware ESXi running on? We’re working on a boot from SAN ‘modernization’ project at the moment. Which is another way to say we’re getting rid of it. It’s way too complicated! And if the SAN goes down, all the boot partitions go with it. This just introduces an extra dependency that can completely nullify any fault tolerant or HA strategies that you may have in place in the vSphere layer. No prizes for guessing who this has happened to recently! What to do instead? The new HS22V blade systems we are using have a tiny little usb port on the motherboard where you can install a USB key. Load ESXi on it, and you’re golden. So I need to make a list of which hosts need fixing up and which are booting from usb already or are using local storage. We’d started this process recently but want to step it up now. But which ESXi machines in the farm are booting from what ? How can you tell? With fdisk of course – simply enable Remote Tech Support mode (see here for details) and ssh into your host. and look for the ‘*’ in the boot column. That’s the partition that ESXi is booting from. If you see a device called /dev/disks/mpx.vmhba32:C0:T0:L0 , you’re booting from usb. If the device is something more like /dev/disks/naa.600508e000000000194a56b4310b4804 you are booting from SAN or a local disk. 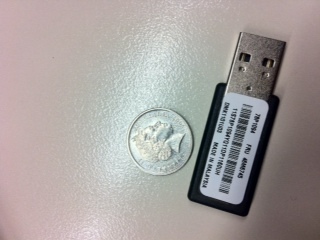 Here’s the fdisk output for my usb stick. Wow, slow 2011 on the blog so far. Time to get back into it. I was asked by a customer how to uninstall Process Server, while keeping your Portal Server intact. I couldn’t find any documentation or steps to do this, so I figured it out for them. “Your mileage may vary” – give this a try on a test box first, before you try on a production box. I didn’t test clusters either, although I don’t see how they would present a problem. These steps are valid for 6.0 . Unfortunately, the Process Server uninstaller doesn’t do a great job of cleaning up after itself, so we need to go around after it and clean up the mess. Bingo! You have Process server. 2. Run the config task bpe-unconfig . This config task will uninstall Process Server related components from your Portal Server (like the Task Container Enterprise Apps) . Take care to make sure this box below is unticked, so your whole AppServer isn’t uninstalled. 4. After the uninstaller is completed, delete the following jars in AppServer/lib . They are Process Server jars, and the Portal Server (or server1) will not start until you do this. As you can see there are tons of them. I got the list from seeing what was on the Process Server install iso. This list worked for me in my testing (which consisted of starting Portal and the Admin Console and making sure the UI still worked), but I can’t vouch for any custom code that you are running. As always, try this out in a test environment first, and take a backup before messing around with AppServer/lib . This seems to be a superset of what was installed on my system too – so don’t be alarmed if some of the jars in this list are not present on your system. 5. It’s also a good idea to clean out wp_profile/logs/* as there is a cache of jar file paths and their associated classes (the preload cache) that will need to be regenerated after deleting those jars. 6. The only thing the bpe-unconfig task doesn’t seem to do is delete the BPE shared library. To do this, start server1, and log in to the admin console. Navigate to Environment -> Shared Libraries and highlight the BPE library and click delete. 7. You’re done, start Portal and test everything works! I also wrote a little script that does some checks and then does all this for you (except for step 6 which I couldn’t be inspired enough to write a jacl script for). It’s fairly quick and dirty, but if nothing else it will give you an idea of what has to happen to remove Process Server. You can get it here. Just rename the suffix after you download it. Understandably, WordPress would not yet me save a shell script up to my server. 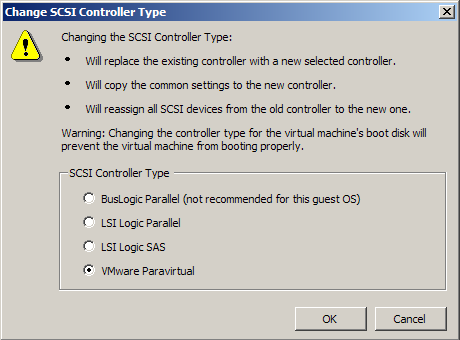 One of the most popular posts on the site has been about how to enable the paravirtualized scsi driver (pvscsi) on your root partition in a RHEL system. I wrote some pretty complex steps about how you could automate this through RHEL’s kickstart system. A reader response to the prompted me to try it out pvscsi on Ubuntu Server (10.04) . Well there’s not much to say – it just works! . When you create your VM in vSphere, simply select the “Custom” option, rather than the “Typical” one as custom allows you to pick your disk type. When the disk type radio button comes up select PVSCSI – and that’s it. When you run the Ubuntu install, the installation process will see the disk as normal, and there it is, you’re done. I’m not sure exactly why this this works in Ubuntu – whether the pvscsi driver has been added to a later version of the kernel, or if Ubuntu/Debian has patched the kernel to include support for it. While we are on the subject of paravirtualized drivers, the vmxnet3 driver also works out of the box in the Ubuntu 10.04 install. I’ll give it a try on RHEL6 soon, I haven’t tried it yet and am curious if it works in the same way. There are some caveats about pvscsi. There are some very good reasons not to use it – first it’s not supported by VMware on the boot disk as described above, and secondly it should not be used in a low throughput environment. The gotchas around pvscsi has changed – according to this KB article , the issue Scott identified with pvscsi in non intensive I/O workloads has gone away in vSphere 4.1, so . Thanks to at Matt Liebowitz at thelowercasew.com for spotting this. You can read his post on it here. . Matt asserts that the boot disk restriction is gone in 4.1 also, but it still unfortunately applies on Linux guests, according to this other KB article. I would suspect this is because it has been so tricky to configure. With it being included out of the box in Ubuntu Server, maybe they will lift this restriction soon? Personally, since I am running a dev and test lab, I think I will switch over to it exclusively anyway. I’ve done a bunch of testing over the last week around this error, installing different fixpacks and versions of DB2 on Ubuntu. To recap, this error happens because DB2 can’t understand the more modern and secure sha512 password cipher and must use the older md5 cipher . About 6 months ago I wrote a post about how to workaround the problem on Ubuntu and other modern Linux distributions. To make a long story short, this problem goes away with DB2 9.5 fixpack 5 , and DB2 9.7 . It is still present in DB2 9.1 fixpack 9, which is the most recent version of the DB2 9.1 series at the moment, so you will need to perform the steps in the linked post above if you need to be on this version. Otherwise, it would be much simpler and more secure to go to the latest fixpack of 9.5 or 9.7. DB2 Silent Install Error: The return value is “5121”. I hit an interesting problem with DB2 yesterday. I’m a big user of the DB2 silent install. This is a system where you run the DB2 install once manually, and it generates a response file for you. 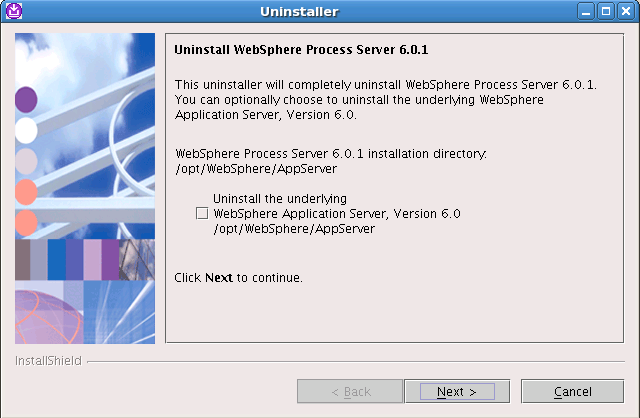 Then you can pass the response file to the installer and run unattended installs. This is great if you want to run the install hundreds of times 🙂 . One of the great things about how DB2 releases fixpacks is that they are installable. What I mean by this is that you don’t have to install the first version of the software and apply patches to it, you can just apply the patch at the outset. Administration Server. The return value is "5121". "db2inst1". Create or make any changes to this user manually. What was interesting was the installer would breeze through creating the groups, but baulk on creating the users. The problem turned out to be a mismatch between the algorithm used to encrypt and read back the passwords in the response file. Something changed in the algorithm in DB2 9.7 FP2 and I was using an old response file from the GA version of the code . Both versions are incompatible with each other. You can clearly see the differences below. 9.7 GA, 9.7 FP1 (also works with 9.5) . Obviously security has been increased in FP2 because the password hash is so much longer. Please note that it’s not forwards compatible either. What I mean by this is that the newer version of the response file will not work with older versions of the code either. To conclude, the solution in this case is simple. Rerun the installer that comes with DB2 9.7 FP2 and generate a new response file for use with this version. I looked through the DB2 APARs list trying to find the fix that changed the encryption algorithm, but couldn’t see it. DB2 backups are platform specific. Well, pretty much, it’s a bit complicated. Recently, someone sent me a Windows DB2 backup for me to look at, and I wanted to move it to a Linux machine. Here’s some steps about how you would do this. where is the name of the database you want to move. 2. Copy the database.sql to your destination machine. 3. Create a database on the destination machine. You can use the same name, or use a different name and edit first connect statement in the database.sql file to point to the new name. 4. If you look at the database.sql, you will notice that the CREATE TABLESPACE commands will have paths in them. This will probably present a problem, since the paths are unlikely to exist on your destination machine. There are a number of ways you could deal with this, but the easiest in my opinion is to just use DB2’s automatic storage feature and let DB2 worry about it. To show you what I mean by this, here is a tablespace definition from my source database script, straight from db2look. Much simpler, but you will need to change these tablespace definitions by hand. I had a problem on my system, doing a Windows -> Linux restore. The database.sql had Windows line endings in it, and so when running it on Linux the command just hung. Running dos2unix database.sql fixed it. (This problem was the actual point of this post, but it seemed hard to explain by itself, so…. here we are). 6. Now you should have a skeleton database on the destination, with all the tables there just ready to receive data. To copy the actual data, we’ll be using db2move. 7. This should fill the folder up with .ixf and .msg files . Copy the entire folder to your destination machine. SQL0668N Operation not allowed for reason code "1" on table "<tablename>". This means – “You need to check this table, to make sure it is valid” . To do this, you can query the system catalog table to get back a list of all the tables that need checking, and with a little awk, generate a script to run against the database. There’s probably a prettier way to do this, but it works. Now you’re done. If you run a simple select statement against one of the tables you have loaded into the database, DB2 should return with the data. It’s worth noting that this method will work if changing versions of DB2, and will also cover moving from 32 bit versions of DB2 to 64 bit.